Transferring its focus from printed comics to the film world, Marvel has become a cinematic powerhouse in recent years—they’re currently releasing two movies a year, and in 2017 they’ll start releasing three. In a departure from the fabled behemoth that is The Avengers, Marvel’s Doctor Strange offers up a good-old-fashioned origin story for one of its lesser-known characters. 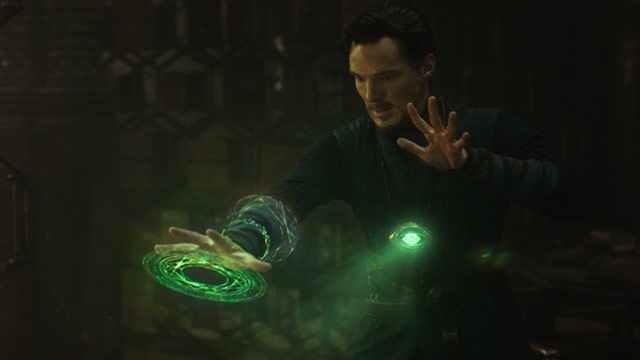 Dr. Stephen Strange (Benedict Cumberbatch) is a talented but extraordinarily arrogant neurosurgeon who travels to the faraway land of Kamar-Taj (a fictional town in Nepal) after a terrible car accident breaks his hands, thus rendering him useless in his profession. Upon arriving in Kamar-Taj, he meets the Ancient One (Tilda Swinton), and together they embark on a mystical journey in order to harness the power of magic to heal his body and, incidentally, travel seamlessly through space and time. Sounds awesome, right? And it is, except for one small problem: Kaecilius (the incomparable Mads Mikkelsen), one of the Ancient One’s rogue disciples, wishes to use his wisdom to subvert the conventions of time and attain immortality from “the dark dimension,” wreaking havoc on the world as we know it in the process. A wild, sci-fi, time-bending battle between good and evil ensues. As we’ve come to expect, Marvel has delivered another entertaining, action-packed blockbuster. Meta jokes are interspersed amongst the fantastical—and occasionally absurd—material (the exchanges between Kaecilius and Dr. Strange are hilarious). The magical, interdimensional aspect of this particular installment results in some truly incredible special effects; however, the focus on the effects does end up detracting from the depth of the world itself. The heart of this film is its talented cast: Fast-talking and smooth, Cumberbatch brings his usual odd elegance to the titular role, but Mikkelsen steals the show as his opponent. Though his villainous character is woefully underdeveloped, Mikkelsen adds nuance, levity, and intrigue to his portrayal, and you will be left wanting more Kaecilius in the Marvel Cinematic Universe. Chiwetel Ejiofor is marvelous as Strange’s fellow disciple Mordo, and be sure to look out for some truly great moments from Benedict Wong as Wong, the librarian of Kamar-Taj. Swinton is, as always, a delight, although it is disheartening to see Marvel whitewash a canonically Tibetan character, a choice that essentially sacrifices the cultural roots of the story’s mythos. All in all, Doctor Strange takes the superhero action of the Marvel Cinematic Universe to a different dimension, all while remaining relatively faithful to its comic origins. Though not the deepest of films, it ties into the world of The Avengers and Guardians of the Galaxy with several fun-to-spot Easter eggs, and provides audiences with an entertaining two hours. Oh, and be sure to stick around during the credit sequence for not one, but two teasers.